Shakespeare: Quite possibly the most influential and, some would say, the greatest playwright that ever lived. His plays are near legendary for the impact they had upon drama and literature. Among those plays is what many think of as the quintessential love story, Romeo and Juliet. The classic tale of two "star crossed" lovers caught between their families' feud. So why did it take this long for such an influential play to be adapted into an anime? The result of this adaptation is the very creatively named Romeo x Juliet, a 24-episode series that originally aired in Japan in 2007. The key point to keep in mind with Romeo x Juliet is that it is merely based on Shakespeare's play, not just "an animated Romeo and Juliet" - the show does a great deal to differentiate itself from its roots. 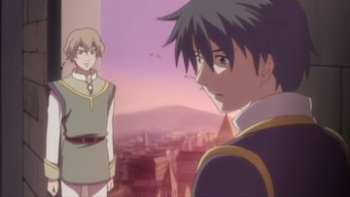 The setting is still based largely on Renaissance-era Italian culture, with some fantasy elements worked into it. The bulk of the story takes place in a city called Neo Verona, which inexplicably floats in the air. For transportation, more affluent nobles use flying horses called "dragonsteeds," and the city conceals some sort of secret magical tree that apparently sustains all life on the planet. Despite that, the action is still very much like that of the play - don't expect anyone to be throwing around fireballs or summoning monsters - all of the characters' abilities are restricted to those of normal humans. The story is also different enough that you'll never really be sure what's going to happen next. The Montagues and Capulets are still at war, and their respective children Romeo and Juliet still fall in love, but that's about it. The Capulets had been the ruling house of Neo Verona, and within the first two minutes of the series, the Montagues completely overpower the house and slaughter them in a bid for power, leaving only Juliet to escape. A few retainers and guards loyal to the Capulet family take Juliet into hiding, and conceal Juliet's true heritage from her until her 16th birthday. She is raised to disguise herself as a boy in public, since Lord Montague would be looking for a girl, and becomes quite adept at handling a sword. Feeling the harsh rule of Montague is unfair, Juliet disguises herself in red, and becomes something of a Zorro-like hero nicknamed "the Red Whirlwind," helping the citizens of Neo Verona and resisting the Carabinieri, the city's militarized police force. It is under the guise of the Red Whirlwind that she first meets Romeo, who swoops down on his dragonsteed to save her from the Carabinieri, though she is initially cold towards him, irritated that he interrupted her fight. The next day, though, she sneaks off to a masquerade ball hosted by Lord Montague - only this time, dressed as a girl. Here, she meets Romeo again, and this time, both are immediately attracted to one another. As you may expect, when she discovers her true heritage and Romeo's family ties, the news does not go over well. This conflict of love versus heritage becomes a central issue for both Romeo and Juliet - much like the play on which the anime is based - which eventually culminates in the famous balcony scene, even if the context of the scene is not what you'd expect. Romeo x Juliet has a bit of everything - drama, romance, action, humor - and it's paced well enough that there never seems to be too much of one thing. Much like the original play, the anime spends a good deal of time (but not too much) developing minor characters, leading to a deeper background for the series. To be honest, there isn't much I can think of to not like about Romeo x Juliet. The animation is top-notch; all of the sequences - action or otherwise - are animated both smoothly and vividly. The English dubbing is also above average, and the English dub is even written with some early modern English that makes it sound that much more Shakespearian. Of course, all of this would make no difference if this anime was unable to live up to the quality of the original play. Fortunately, I'm happy to say that it most certainly does. The writing is good enough and the characters maintain their believability to the point that the series can afford to take its creative license, and in general, it compares favorably with the original play. And really, Romeo and Juliet has been adapted and retold with the same basic storyline so many times over the years, that Romeo x Juliet deviating from the original material isn't really a bad thing - in fact, I think it would've been disappointing if it didn't. Bottom Line: Romeo x Juliet expertly adapts the classic tale of the "star crossed lovers" into anime form, and while the story deviates quite a bit from the original, it still manages to be enjoyable, and lives up to the legacy set by the beloved play. Recommendation: If you're a Shakespeare buff, or are looking for an anime with a nice balance of action and romance, you shouldn't miss Romeo x Juliet. Josh Viel wishes he were creative enough to work Shakespeare quotes into his bylines. Unfortunately, important things like sleeping take up far too much of his very valuable time. This review covers Romeo x Juliet: Romeo Collection, which consists of the first twelve episodes of the series.